LAKE MARY, Fla., Oct 11, 2011 — BlueChip Energy, LLC (BCE) an independent solar power producer, today announced it has signed a letter of intent with Neo Solar Power, a Taiwan-based solar cell manufacturer, for an equity participation in BCE’s 120 MW Sorrento Solar Farm project. As part of the agreement, Neo Solar Power will contribute at least 10 MW of its high efficiency solar cells for an equity stake in the project, which is currently under construction in Lake County, FL. 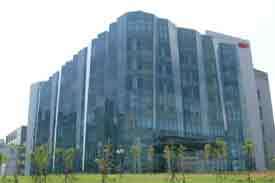 The cells will be converted into solar panels by Advanced Solar Photonics, BCE’s manufacturing subsidiary. Neo Solar Power focuses on high-efficiency crystalline silicon solar PV cells. As of the second quarter of 2011, the company had installed capacity of 1.3 GW. “We are delighted to be working with NSP as a partner. They are one of the largest cell producers in the world, their product is top quality and, most importantly, NSP’s executive management understands that to truly thrive in the PV industry, it is necessary to put your product to work in project generating electricity revenue,” said Yongshuang Wang, VP of Strategic Development for BCE. The LOI between BCE and Neo Solar Power is a major milestone in the US solar power industry as it marks the introduction of a new business model for developing solar power projects, without the use of power purchase agreements (PPAs) and financed by manufacturers themselves, rather than financial institutions. BCE’s new solar power development model will be described in more detail in an upcoming series of Executive Briefings to be released by the company over the next few weeks. – Federally Licensed: The project has Qualifying Facility status (FERC Docket Number QF11-240-000) and Wholesale Generator status (FERC Docket Number EG11-58-000) certified by the Federal Energy Regulatory Commission. With the growing PV equipment supply glut — solar market research provider Solarbuzz estimates panel oversupply as high as 11 GW in 2012 (www.solarbuzz.com/our-research/recent-findings/production-cutbacks-insufficient-prevent-solar-module-inventory-buildup) technology providers are starting to move “downstream” in the solar value chain to electricity production and sales. BCE has signed LOIs with other solar panel and cell producers to contribute their products in the first 40 MW stage of the Sorrento Solar Farm and expects to finalize supply and joint venture contracts with them before the Solar Power International trade show in Dallas, October 17-20. BlueChip Energy, LLC (BCE) is a fully integrated solar PV power generator, occupying all segments of the solar power value chain — from the manufacturing of solar panels and balance of systems components by its wholly owned subsidiary Advanced Solar Photonics, to the sale of turnkey solar power plants, to the sale of solar electricity to utility, commercial and residential customers. BCE develops, finances, builds, operates, and monitors solar plants for companies and individuals, as well as for its own portfolio. BlueChip Energy’s two flagship utility scale solar projects, the Rinehart Solar Farm (10 MW) and the Sorrento Solar Farm (two phases of 40 MW and 80 MW), received approval from the Federal Energy Regulatory Commission (FERC) as self-certified small power production facilities, or Qualified Facilities (QFs) earlier this year, requiring the local utility to provide interconnection to them and purchase the electricity they produce. Additionally, these two solar farms have received approval to operate as Exempt Wholesale Generators (EWGs), providing the facilities with undisputed access to the power distribution network. FERC has also granted the company Market-Based Rate Authorization, allowing BCE to purchase and sell wholesale electricity and offer renewable energy products to customers. Advanced Solar Photonics, LLC (ASP), a wholly owned subsidiary of BlueChip Energy, is a manufacturing and research and development center for crystalline silicon solar photovoltaic (PV) panels for utility, commercial and residential applications. Based on the latest cell efficiency, light transmission, and encapsulation technologies, ASP focuses on high-efficiency, state-of-the-art solar PV modules ranging from 200 Watts to 400 Watts. 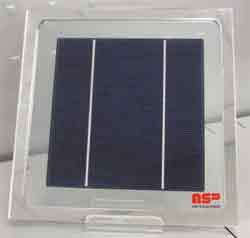 ASP is the third largest producer of crystalline silicon PV panels in the United States and is one of the few producers in the US of Buy American Act compliant products suitable for government, military and municipal projects and meeting the requirements of Section 1605 of the American Recovery and Reinvestment Act of 2009. 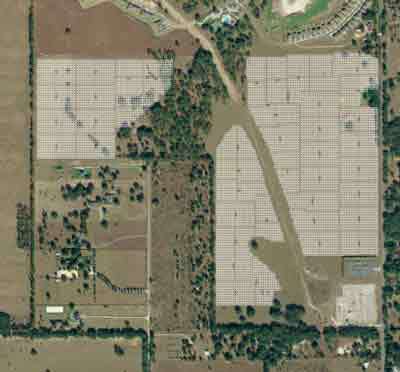 The Sorrento Solar Farm is a 40 MW solar photovoltaic project on a 160-acre plot in Lake County, Florida. The project will consist of approximately 174,000 230-Watt mono-crystalline solar PV panels. BCE estimates the project will require approximately one year to complete from the commitment of funds by its financing partner. This entry was posted in Florida Technology News. Bookmark the permalink.